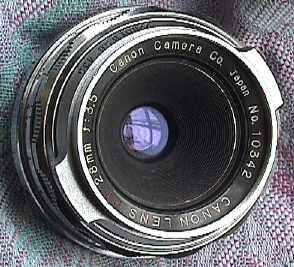 Cantax 28mm f/3.5: Canon lens in Contax Mount!! This is a very rare lens, and one of those instances where truth is stranger than fiction. 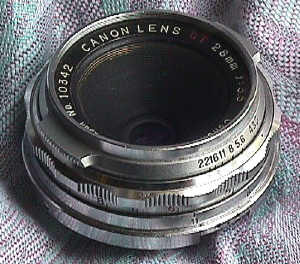 Very strangely this is a Canon made 28mm f/2.8 in Contax rangefinder mount! So far as is known, this is the only time Canon made Contax mount lenses. A few have surfaced over the years. Estimated production is 200. Notice the very heavy duty and well finished chrome lens barrel. Apparently Canon thought they could break into the Contax mount alternatives, just like they very successfully broke into the Leica mount alternative lenses. 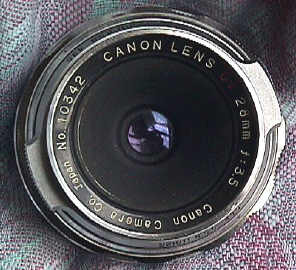 For reasons which have not been documented, this was apparently Canon's only attempt at a Contax mount lens. This lens variation was written about in the Nikon Historical Society several years ago. 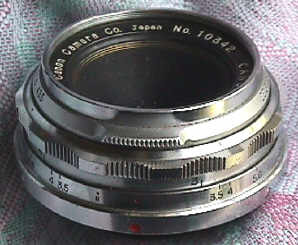 The assumption is that it is Contax mount since Canon previously copied the German Leica screw mount. The possibility exists that it was intended for the Nikon mount rangefinder -- the differences are so slight it would be impossible to tell without a careful lab analysis -- since Nikon was also offering their lenses in the Leica screw mount which Canon chose as their own! That would have been an interesting competition. If Nikon made Canon lenses, why shouldn't Canon make Nikon mount lenses? The postscript to this possibility is that Nikon stopped making their lenses in Leica screw mount (which were also usable on Canon Rangefinders) in the late 50's. I wonder, if this small production run of Canon 28's had something to do with their decision? Revised: September 13, 2017 . Copyright © 1998-2002 Stephen Gandy. All rights reserved. This means you may NOT copy and re-use the text or the pictures in ANY other internet or printed publication of ANY kind. Information in this document is subject to change without notice. Other products and companies referred to herein are trademarks or registered trademarks of their respective companies or mark holders.